The patients were 'absolutely thrilled, surprised and delighted' by the gift, including one 89-year-old woman who has her own royal connection. The flowers at the royal wedding of Prince Harry and the former Meghan Markle, Duchess of Sussex, made Windsor's St. George's Chapel look as if it was straight out of a fairy tale — but now, they've found a new home. The socially conscious newlyweds donated some of their wedding flowers to patients at St. Joseph's Hospice in nearby Hackney, a borough in London. An employee at the hospice told TODAY Style they received 50 bouquets the day after the wedding and gave them to patients, who were "absolutely thrilled, surprised and delighted." 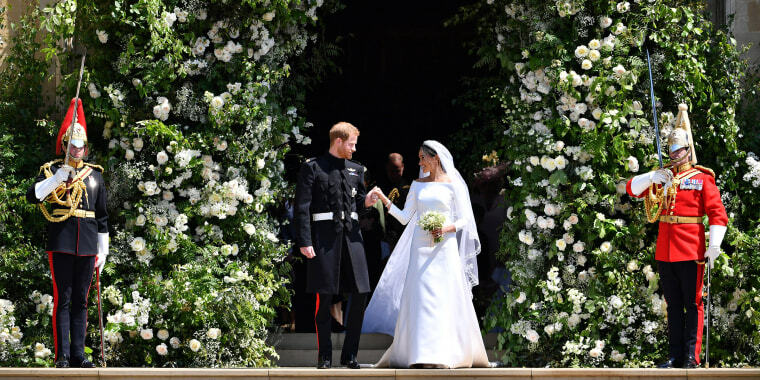 The hospice thanked the couple, now formally known as the Duke and Duchess of Sussex, as well as their wedding florist, Philippa Craddock, in a Facebook post on Sunday. "Our hospice smells and looks gorgeous," the message read. "Such a lovely gesture." One patient was particularly touched: Pauline Clayton, who used to used to work for royal dressmaker Norman Hartnell and helped make many of Queen Elizabeth's dresses, as well as the 15-foot train she wore at her 1947 wedding to Prince Philip. "With my royal connections it's such a lovely coincidence to be at St. Joseph's and receive these wedding flowers," Clayton, 89, said, according a press release from the hospice. "They are beautiful and very special." Aside from simply being gorgeous, flowers were a special part of the couple's big day for other reasons. Prince Harry hand picked flowers from their private garden at Kensington Palace to add to the duchess's bouquet, which included forget-me-nots, the favorite flower of his late mother, Princess Diana. The bouquet also included sprigs of myrtle, a longtime tradition for royal brides. The Duchess of Sussex's own bouquet wasn't sent to the hospice, though. As part of another royal tradition, the bride send her bouquet to the Westminster Abbey to rest on the grave of the Unknown Warrior, just as the Duchess of Cambridge and others have done for nearly a century. Such sweet sentiments, all around!